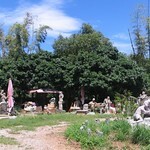 Chen Song stone carving studio is one of the eight ”Home of artists” in Taichung County . The anticipation of “Home of artists” is to have an open space studio, and to provide people who are interested in art, to learn carving in close proximity to home. The studio is alternative school education, providing the sculpture tool, and people who are willing to pursue creation have no entry fee. Classes are classified into fundamental class, intermediate class and advance class with flexible studying time. Some people studying in intensive classes within few months can upgrade to advance classes. Some people who study for a few months would stay in the same level of fundamental class. It depends on people’s comprehension and learning progress. During the period, there are people who are trained nationally ranked stone craving artists from the studio, such as Keyu Guo, Meiyi Lin, Shaolun Hong and other numerous artists. Besides, the studio is cooperated with Taichung Shoreline Community Courses and the children activity in National Taiwan Museum of Fine Arts to introduce stone carving to local people.